Ladies, who would like to enjoy a free hair style, cut and color from a world renown salon? Ever heard of Bumble & Bumble Salon? That's right. . . . free! Just one of the many luxuries of living in New York City - Bumble & Bumble headquarters happens to be located right here in town and they are always looking for models! Not the skinny 5 ft. 8 models (though there happen to be a lot of those here in the city as well), but anyone with a full head of hair and time to relax at the salon. 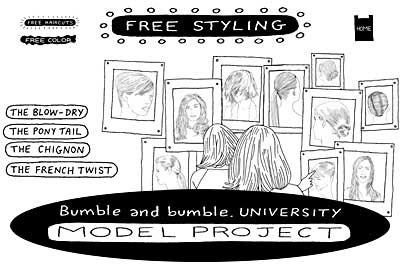 Here's the deal: Bumble & Bumble runs a hair school, called B&B University, and just as they do for their regular customer salons, their University is top notch. They offer their students live models (not a plastic mannequin head) to practice on. So, I took the opportunity to sign myself up as model. All you have to do is sign up online and then show up for a scheduled "model audition" (which is just showing up with your hair brushed and they check to see if you have an appropriate length). Once you are an approved model, the fun starts. You can sign up for as many styling, cutting or coloring sessions as your schedule allows. Ever fantasized about being the practice-body for a massage school? Well, this is one of those instances. Each session is about two hours, and each time I've left with an amazing new style. The students are always very nice, and usually are professional hair dressers themselves who are just attending to get B&B certification credit. They are from all over the world - the last session I attended the students were all from France. To encourage loyal models, each time you attend a session, B&B gives you a $10 credit toward any of the Bumble products (as if you needed this extra incentive?). And just as an extra bonus, the B&B Uni salon is on the 6th floor of a beautiful glass-and-steel Meatpacking district building, complete with skyline views of the city! My only word of advice is that you should be sure to schedule a dinner date that eveing, as you'll be looking too fabulous to simply return home for the day. Go to the B&B University Model page to sign up and for all the details.